Well Ellen, at least it was better than the flower show at Hofstra university. Oy Melanie, I remember that well! But at least I had you and ESP to keep me company. 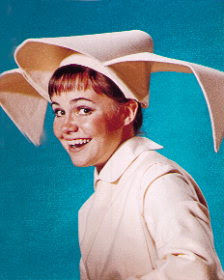 Upstaged by The Flying Nun? Totally unfair. Hope the next one drew the crowd you deserve. I wonder if she mentioned that one plus about "healthy gardening" is that - wait for it - it's great for bone density! So you won't be needing any Boniva. Yes, Garden Faerie, it's a good name for a gardener! Apparently her favorite Christmas present last year was a chain saw. I wondered how it was going to be for whomever might be scheduled in the same time slot. Sorry to hear how deeply it impacted your attendence. Glad our little city treated you reasonably well. You did good, both with Hing Loon and with Le Pichet.